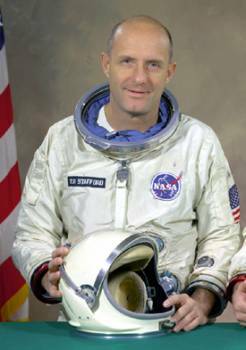 Thomas P. Stafford flew on Gemini 6, the first space rendezvous mission, and Gemini 9; orbited the moon on Apollo 10, and commanded the American ship that linked in orbit with a Soviet craft during the Apollo-Soyuz flight. He was born in Weatherford, Oklahoma, Sept. 17, 1930. He received a Bachelor of Science degree from the United States Naval Academy in 1952, graduating with honors. He also has several honorary degrees. Following graduation from the Naval Academy, Stafford was commissioned a second lieutenant in the U.S. Air Force. He completed advanced interceptor training and served tours of duty at Ellsworth Air Force Base, S.D., and at Hahn Air Base, Germany, where he flew F-86Ds. He graduated in 1959 from the Air Force Experimental Flight Test Pilot School at Edwards Air Force Base, California, and received the A.B. Honts award as the outstanding graduate. He remained with the school as an instructor and later was chief of the Performance Branch. Stafford was selected as an astronaut by NASA in 1962. In December, 1965, he was pilot of Gemini 6 and he and commander Wally Schirra flew the first space rendezvous mission, closing to within a foot of Gemini 7, with astronauts Frank Borman and Jim Lovell aboard. He commanded Gemini 9, with Gene Cernan as pilot, in June, 1966, rendezvousing with an alternate docking target after the Atlas boosting their original Agena target failed. They were unable to dock with the alternate because a protective fiberglass shroud had failed to separate completely, but they flew three different types of rendezvous with it. Stafford commanded the Apollo 10 lunar orbit flight in May 1969, with John Young and Gene Cernan. He and Cernan separated the Lunar Module and approached to within 10 miles of the surface, paving the way for the Apollo 11 crew to make the first moon landing two months later. Stafford logged his fourth space mission as commander of the Apollo-Soyuz Test Project in July 1975. He, Deke Slayton, and Vance Brand linked in orbit with a Soyuz carrying cosmonauts Alexei Leonov and Valery Kubasov. Stafford returned to the Air Force and assumed command of the Air Force Flight Test Center in 1975. He was promoted to lieutenant general in 1978 and was assigned as Deputy Chief of Staff, Research Development and Acquisition, Headquarters, USAF, Washington, D.C. He retired from the Air Force in 1979. He co-founded the Technical Consulting Firm of Stafford, Burke, and Hecker, Inc. in Alexandria, Virginia. He sits on the Board of Directors of six corporations listed on the New York Stock Exchange, one listed on the American Exchange, and two others, including Seagate Technology, Inc. Seagate Technology is the largest independent hard disk drive maker in the world. He has served as an advisor to a number of governmental agencies including NASA and the Air Force Systems Command. He was a defense advisor to Ronald Reagan during the presidential campaign and a member of the Reagan transition team. He served on the National Research Council’s Aeronautics and Space Engineering Board; the Committee on NASA Scientific and Technological Program Reviews and Vice President Quayle’s Space Policy Advisory Council. He was Chairman of the NASA Advisory Council Task Force on Shuttle-Mir Rendezvous and Docking Missions, is currently Chairman of the NASA Advisory Council Task Force on ISS Operational Readiness, and Co-Chairman of the Stafford-Covey Space Shuttle Return to Flight Task Group. He and his wife, Linda, live in Alexandria. Stafford serves on the Board of Trustees of the Astronaut Scholarship Foundation. Thomas Stafford was inducted into the U.S. Astronaut Hall of Fame on March 19, 1993.